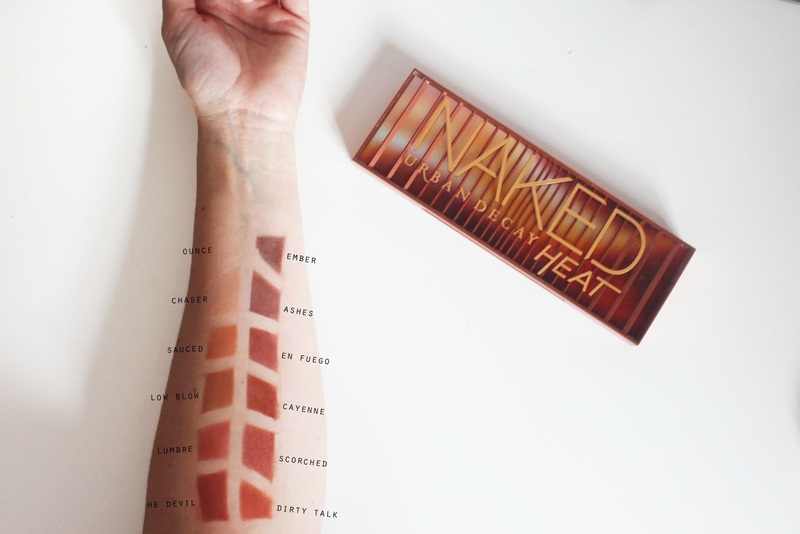 Naked Heat Palette Swatches And First Thoughts. Well DAMN Urban Decay have done it again and released a quite literally smoking hot eye palette that I needed in my life. I have every other Naked palette apart from the basics so of course this one was on my list when I saw the promo photos on their Instagram. Now I know you've probably seen every blogger and their cat post about this palette but obviously I have to join, at least I've tried to wait for the hype to die out a little. Just look at those shades, seriously. I've already used the palette a few times and I am truly in love, the colours are so warm and pretty and even though it's a summer themed palette the colours are clearly perfect for an Autumnal look with the red and brown hues. All of the shades compliment each other no matter what you do with them, so as long as you blend you can get a gorgeous eye look even if you're awful at applying shadows like me. I have to admit, I'm obsessed and I'm sure I'll be using it on the regular. Hats off to Urban Decay because they've done something really unique and it's perfect. I cannot wait to see what they come up with next.